Activision and Treyarch have announced that fans will be able to play Call of Duty: Black Ops 4’s popular Battle Royale mode for free in the Blackout Free Trial, which begins Thursday for one week on PS4, Xbox One and PC. Watch the Call of Duty: Black Ops 4 — Blackout Free Trial Announcement Trailer HERE. 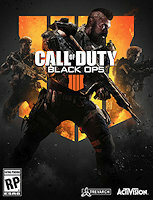 For more information, fans can visit www.callofduty.com.